Maroon 5 is an American rock band from Los Angeles, California. While they were in high school, vocalist and rhythm guitarist Adam Levine, keyboardist Jesse Carmichael, bass guitarist Mickey Madden, and drummer Ryan Dusick formed a garage band called Kara’s Flowers in 1995 and released one album in 1997. 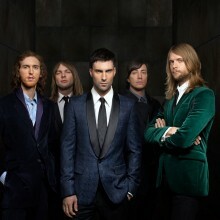 They reformed, with guitarist James Valentine, in 2001 and pursued a new direction as Maroon 5. The following year they released their debut album Songs About Jane, which contained four hit singles: “Harder to Breathe”, “This Love”, “She Will Be Loved” and “Sunday Morning”; it also enjoyed major chart success, going gold, platinum, and triple platinum in many countries around the world. In support of Songs About Jane, Maroon 5 toured extensively throughout 2003–2005, during which time two live albums were released. The band won the Grammy Award for Best New Artist in 2005. Dusick left the band in September 2006, citing injuries sustained by constant touring, and was replaced by Matt Flynn. Maroon 5′s second studio album It Won’t Be Soon Before Long was released in 2007, with the singles “Makes Me Wonder”, “Won’t Go Home Without You” and “Wake Up Call”. The band performed live in two tours between June and November 2007, during which time a compilation of previously unreleased songs, The B-Side Collection, was released. Two more live albums and a remix album were issued in 2008. Maroon 5′s third studio album Hands All Over was released in the U.S. on September 21, 2010. Since debuting in 2002, the band has sold over 10 million albums in the United States and nearly 15 million worldwide. band put together a demo that was rejected by several labels, before falling into the hands of Octone Records executives James Diener, Ben Berkman and David Boxenbaum. While looking for talent for the new Octone label, Berkman was given a bunch of demos by the brother of a former colleague at Columbia Records and the song that caught his attention was “a genius song called ‘Sunday Morning’”. Berkman was surprised the song was credited to Kara’s Flowers because they sounded completely different to the band he had heard while at Warner Brothers. Berkman encouraged Diener and Boxenbaum to fly out to L.A. to watch a showcase gig at the Viper Room for the four-piece Kara’s Flowers. After watching Levine onstage, they were convinced. Berkman told HitQuarters he believed what the band needed was a “fifth member to play the guitar and free up the singer, so he could be the star I perceived him to be.” Within a month of hearing the demo Kara’s Flowers became the new label’s first act. Octone immediately insisted that the band change its name to break with its pop-rock past. Also, the label began looking for a full-time guitarist to enable Levine to focus on performing as the frontman. James Valentine (from the L.A. band Square) was recruited for the job. Even still, the only songs of their repertoire that showcased the band’s new direction were “Sunday Morning” and the soon-to-be-written “She Will Be Loved”—neither of which the label approved of as a first single. The band toured for a full year before entering the studio with producer Matt Wallace. Levine’s frustration with Berkman’s demands for a lead single inspired him to write just that—a song called “Harder to Breathe”. Maroon 5 was constantly on tour, after releasing their album in mid-2002. Their first major tour was the 2002 Jeep World Outside, a “grassroots” summer festival tour with such acts as O.A.R., Ziggy Marley, Train and headliner Sheryl Crow. Valentine attended Berklee College of Music with John Mayer in 1996, where they developed a rapport. In 2002, the two reconnected at a Mayer radio appearance. After Mayer heard their album, he was so impressed (particularly by “This Love”) that he invited them to open for him during his early 2003 tour. The first single “Harder to Breathe” slowly started to pick up airplay which helped spur sales of the album. By March 2004, the album had reached the Top 20 of the Billboard 200 and “Harder to Breathe” had made the Top 20 on the Billboard Hot 100 singles charts. The album peaked at #6 on the Billboard 200 in September 2004, 26 months after its release; this was the longest period between an album’s release and its initial Top 10 appearance since SoundScan results were included in the Billboard 200 in 1991. Mayer invited the band to open for him again in 2004. Over the next three years, the band toured virtually non-stop, including visits to seventeen countries. During this time, the band toured with Michelle Branch, Nikka Costa, Vanessa Carlton, Graham Colton, and The Rolling Stones. Others they have toured alongside include Cowboy Mouth, Gavin DeGraw, Matchbox Twenty, Sugar Ray, Counting Crows, Phantom Planet, The Hives, Dashboard Confessional, Big City Rock, The Like, Simon Dawes, Jason Mraz, The Thrills, Thirsty Merc, Marc Broussard, The Donnas, The RedWest, Michael Tolcher and Guster. Maroon 5 also played Live 8, in Philadelphia in 2005. Their set included a cover of Neil Young’s “Rockin’ In The Free World” and frontman Levine performed with one of his heroes, and the closing act, Stevie Wonder. On May 13, 2005, in Santa Barbara, California, the band wrapped up the Honda Civic Tour, which they headlined. On June 9, 2005, the band performed at the American Film Institute’s tribute to filmmaker George Lucas. Lucas himself had selected Maroon 5 for the event, as they were his children’s favorite band at the time. Over the years of touring with the band, percussionist and back-up vocalist Ryan Dusick had been suffering from the touring life. The strains of non-stop touring aggravated an old sports injury. After several absences from the tour with Ryland Steen and Josh Day taking his place, Dusick officially left Maroon 5 in September 2006. Matt Flynn, the former drummer of Gavin DeGraw and The B-52′s, joined the band as Dusick’s replacement. After recording for most of 2006, in May 2007, Maroon 5′s second album, It Won’t Be Soon Before Long, was released worldwide by A&M/Octone Records. According to Levine, the follow-up to Songs About Jane is “sexier and stronger,” gaining inspiration from iconic 80s artists such as Prince, Shabba Ranks, Michael Jackson and Talking Heads. Before its release, “Makes Me Wonder” was the #1 selling single and video on iTunes. It was also the #1 selling album, with more than 50,000 digital pre-sales. After its release, the album broke iTunes sales records its week of release, selling over 101,000 albums. The first single, “Makes Me Wonder,” was released to radio March 27, 2007. The making of the music video was previewed on MTV’s Total Request Live, and premiered on the show March 29. The song debuted at number 84 on the Billboard Hot 100, the lowest debuting single of the group’s five chart entries. In the first week of May, the single skyrocketed from a lowly position of #64 to #1, the biggest jump in Billboard history at the time. “Makes Me Wonder” has also achieved #1 on Billboard’s Hot Digital Songs, Pop 100, and Hot Dance Club Play charts. Levine has stated that he believes the band is reaching its peak and may make one more album before disbanding. He explained “Eventually I want to focus on being a completely different person because I don’t know if I want to do this into my 40s and 50s and beyond, like the Rolling Stones.” Maroon 5′s third studio album was recorded in 2009 in Switzerland, where the band joined forces with record producer Robert “Mutt” Lange. Valentine revealed in November 2009 that the new album had been titled Hands All Over. In May 2010, they revealed that they had written 15 songs for Hands All Over. They are: “How”, “Never Gonna Leave This Bed”, “Last Chance”, “Don’t Know Nothing”, “Out of Goodbyes” (featuring Lady Antebellum), “I Can’t Lie”, “Give a Little More”, “Misery”, “Stutter”, “Just A Feeling”, “Runaway”, “Get Back In My Life”, “No Curtain Call” and “Hands All Over”. Hands All Over was released on September 21, 2010. The album’s first single, “Misery”, was released on June 22. Maroon 5 has planned a month-long summer tour in advance of the album’s release, from July 30 to August 29. Do you want to hire Maroon 5? Directly request a quote. In 48 hours we can send you the availability of Maroon 5 If you would like to book Maroon 5, Entertainment Booking Agency is the right place. We will offer you the best price and contact the management or we directly contact Maroon 5. For corporate appearances or speaking engagements you can contact our agents and the will help you true the process. Tags: hire Maroon 5, Maroon 5 booking, book Maroon 5, Maroon 5 appearances, find more information on booking Maroon 5 for appearances, Maroon 5 speaking engagements, Maroon 5 endorsements/spokesperson, Maroon 5 appearance fees, Maroon 5 booking agency contact info, biography of Maroon 5, Contact an artist booking talent agent find a speakers bureau that can book Maroon 5, speaker booking agency for Maroon 5, Maroon 5 booking agency, Maroon 5 booking for corporate event. EBA is one of the biggest entertainment booking agencies in the World. We book hundreds of celebrities, artist, athletes and speakers in a year. Important to know is that we are not claiming to be the management of Maroon 5. We are not the official agent for Maroon 5. Companies from around the globe book these artists and speakers true our company be course we have one of the biggest networks and we always have direct contact with the artist or the management. We help you to find the right celebrities for your corporate of private events. Please contact one of our agents to get free advice and we will help to get the world-famous artist on your party.